After graduating from college, Todd Barber and his father nearly died crossing the Atlantic, from Miami to Bimini, in a 40-foot sailing vessel. The Barbers hoped to make the chain of Bahamian islands, about 53 miles east of Miami, in six hours. Instead, they were caught in a hurricane’s churn for three days. Hurricane Gilbert, which reached Category 5 status on the afternoon of Sept. 13, 1988, spun winds of 185 mph, moved through the northeast coast of Mexico’s Yucatan Peninsula and made landfall over northern Mexico. “It almost killed me,” Todd Barber said of the terrifying trip. “We rode 60-foot seas … and took turns strapping into the helm.” Later, he discovered that the hurricane almost wiped out the coral reefs he had enjoyed visiting in Grand Cayman every summer as a teenager. He would dive alone, plant himself on the bottom, take pictures of the reefs and watch the fish swim by. He even gave the fish pet names. The Reef Ball Foundation did the world’s largest (and most successful) coral propagation project, planting over 10,000 coral colonies and creating a new barrier reef on Maiden Island in Antigua. Barber hung on to his dream of helping oceans by taking up a hobby: making an artificial reef component that would replicate and sustain coral and marine life. During his 10-year career with IBM, he conducted a series of trials and mitigated design errors with his college roommate and diving buddy, Don Brawley. 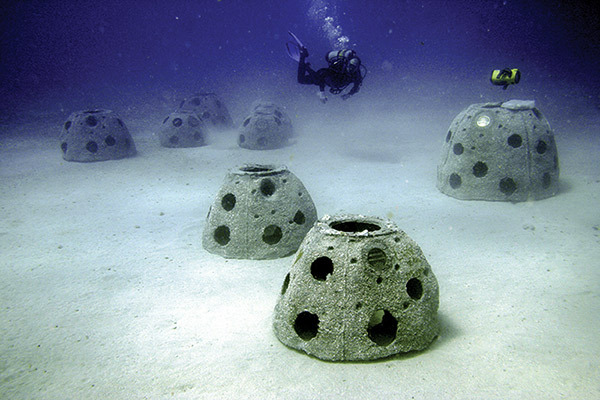 The result was an artificial reef module designed in 1993 that he named the Reef Ball. Barber transformed the hobby into a business and founded the Reef Ball Foundation in 1999. As chairman, he travels around the world restoring ocean reef habitats, working hand-in-hand with governments, businesses, individuals, schools and community organizations. John and Patricia Hanson pre-paid and left instructions for their children to place their ashes together in an Eternal Reef when they passed. The couple had retired to Panama City and later moved to Foley, Alabama. Hanson was a merchant mariner before joining the U.S. Coast Guard and retired as a captain. Last fall, their wishes to combine their nautical heritage with a lasting positive effect on the ocean were realized with their own Reef Ball placed off the Pensacola coast. Hanson laughed remembering how, on the day the family scheduled to take the boat off shore to watch their reef placement, remnants of a storm called Patricia (like his mother) made the Gulf of Mexico too rough, preventing them from going. Over three-quarters of a million Reef Balls, placed in 70 countries and many off coastal states of the United States, contribute to coral growth, estuary and reef restoration and sustainable marine reef habitats. Eternal Reefs are located off the coasts of Florida (on both the Atlantic and Gulf coasts), Texas, South and North Carolina, Virginia, Maryland and New Jersey. Family and friends are encouraged to participate in the casting. The four-day process includes mixing the ashes into the concrete mixture placed on the reef. The top of the reef can be personalized with handprints, inscribed messages and seashells. The Eternal Reef placements are in permitted sites, designated for development as recreational reefs for fishing and diving. The dedication ceremony includes a chartered boat taking families to the site where the reefs are placed from a nearby boat. Even with these initiatives, more help is needed for corals. Corals are animals with tiny, tentacle-like arms for capturing food from the water. They permanently attach themselves to the ocean floor, forming coral reefs, supporting and sustaining the sensitive marine ecosystems surrounding them. The causes of coral decline are varied, Webster says, and include overfishing, unsustainable tourism, pollution, ocean warming and some direct destruction of the reefs. He mentioned that China’s island building in the South China Sea has damaged coral reefs. In addition, carbon dioxide released in the atmosphere and absorbed in the ocean contributes to ocean acidification and coral demise. The solution? Solve the local problem so corals can return. Webster supports building an artificial reef where it makes sense. He recommends providing a new place for corals to grow, maybe sandy areas that can support an artificial reef. Todd Barber is fond of using an analogy when he talks about winning one for the corals. While the process of growing Reef Balls into a living reef system takes about five years, for Barber, that’s not too long to wait. 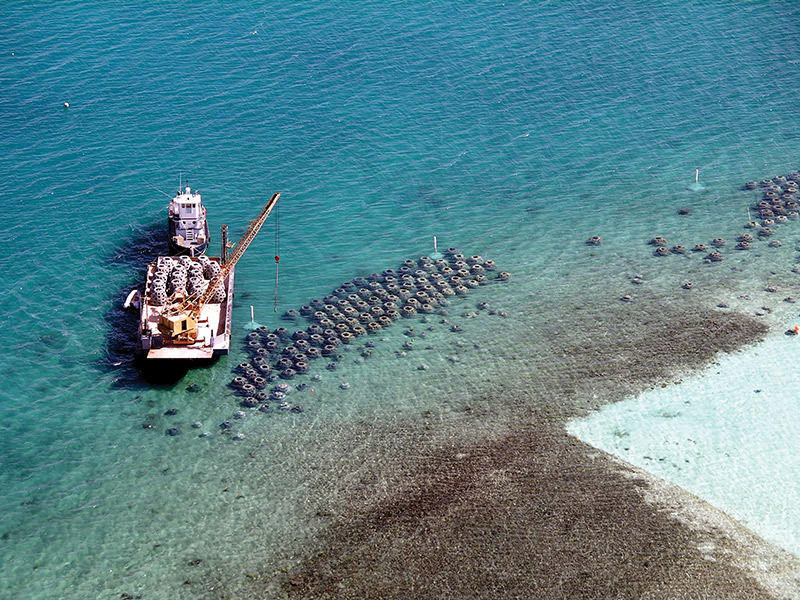 One of his proudest projects was in Antigua, where his team put in 3,200 Reef Balls, planted more than 10,000 corals and rescued another 5,000 corals from the path of a dredge. Today, it is a natural reef system and national park. The artificial reef dome, called a Reef Ball, has a hole on top to prevent the lifting effects of a hurricane-force sea state, with thicker bottom walls and thinner top walls. Other enhancements have been made to accommodate the coral from lessons learned by teams making the module in Mexico. For example, corals are animals that, early in their development, seek to live in grooves and attach to rough textures. The texture of the Reef Ball was roughened, and more holes were cut around the mold to create whirlpools to work with the ocean currents flowing by, carrying nutrients to feed the corals. Reef balls come in a variety of sizes for a variety of places. In about an hour, an average Reef Ball of 4 feet tall, 3 feet wide and 1,500 pounds can be made with $100 of materials.